Six out of 10 doctors are using digital tablets for work, mostly iPads, and half use them at the point of care, according to a survey from health care market research and advisory firm Manhattan Research. The online study surveyed 3,015 U.S. practicing physicians in more than 25 specialties. Tablet use for professional purposes almost doubled since 2011, reaching 62% this year. 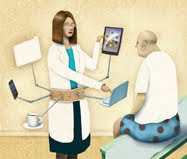 Physicians using tablets, smartphones and desktops/laptops spend more time online on each device and go online more often during the workday than physicians with one or two screens. Adoption of physician-only social networks remained flat between 2011 and 2012. Physicians reach out more frequently to and are more influenced by colleagues they formed relationships with at school or at work than peers who they first connected with online. More than two-thirds of physicians use video to learn and keep up-to-date with clinical information. Is this a good thing? How can doctors manage three computing platforms and still connect with patients? ACP Internist addressed this topic in its April cover story.